Okra is a cultigen (a plant that has been altered by humans through a process of selective breeding). The exact origin of okra is unknown, but it is thought to have come from Africa, where it has been grown as a crop for centuries. Evidence suggests it was grown in Egypt as long ago as 2,000 BC. Today it is widely cultivated for its edible green fruits, which are harvested when immature (after 3-5 days of development), and are infamous for their slimy mucilage. Annual herb up to 2 m. tall; stems succulent, setulose. Leaf-lamina up to 25 × 25 cm., suborbicular in outline, palmatifid, -lobed or -sect, sparsely to densely setulose or setose-pilose on both surfaces especially on the nerves, margins serrate, base cuneate to cordate; petiole up to 30 cm. long; stipules up to 15 mm. long, filiform, densely pilose. Flowers up to 8 cm. in diam., yellow with purple centre; peduncle 1–4 cm. long, stout, thickened in fruit. Epicalyx of 10–12 bracts; bracts up to 25 × 2·5 mm., narrowly linear-triangular, caducous. Calyx 3–4 cm. long, with 5 short linear teeth. Petals up to 7–8 cm. long. Staminal tube 12–20 mm. long; free parts of filaments up to 0·5 mm. long. Style projecting up to 1 mm. beyond the staminal tube. Capsule up to 14 cm. long, ellipsoid to very narrowly ellipsoid, at first appressed-setose and pubescent, later glabrescent. Seeds 5 × 4 mm., depressed-globose, slightly humped, with concentric lines of minute stellate hairs or scales and sometimes pilose. Capsule fusiform, 7–25 (?–30) cm long, 1.3–3 cm diameter, rounded or ± angular, sulcate, with scattered simple hairs or glabrous. Stout erect annual herb, 0.5–2.7 m tall. Cultivada en Colombia; Alt. 20 - 1500 m.; Amazonia, Andes, Islas Caribeñas, Pacífico. Abelmoschus esculentus is also known by the synonym Hibiscus esculentus and the common name lady's fingers, thought to be a fanciful reference to the slender, finger-shaped fruits of some cultivars. 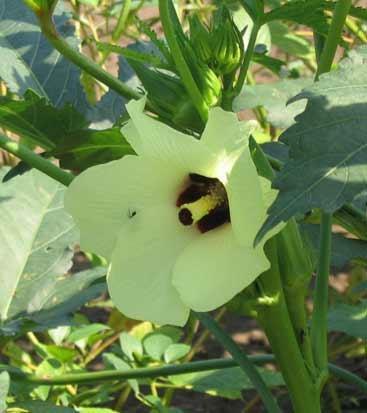 The Malvaceae plant family, of which okra is a member, contains many economically important plants. 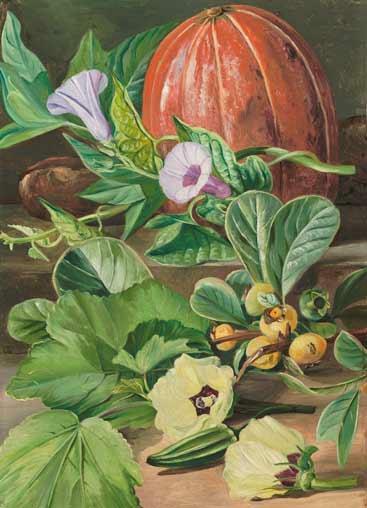 These include cotton (Gossypium hirsutum), cocoa (Theobroma cacao), ornamental Hibiscus species, the genus Ceiba (from which kapok fibre is derived), durian fruit (Durio zibethinus) and balsawood (Ochroma pyramidale). Available evidence suggests that okra originated in Africa, where the vast majority of primitive forms and wild relatives are found. It is thought likely to have come from the Sahel region, south of the Sahara (from Mali eastwards to Ethiopia). Many publications give India as the country of origin, but this is more likely to be a reflection of where it is currently used. There are no names for okra in the classical languages of the Indo-Persian area, suggesting that it probably did not originate there. Later it was introduced to the Americas during the slave trade. Okra is widespread in cultivation in the tropics, subtropics and warmer temperate zones. It is particularly popular in Africa, India, the Philippines, Thailand, Brazil, Turkey, Spain and the southern USA. It is naturalised in some areas. The related species West African okra ( Abelmoschus manihot ) is restricted to the humid and perhumid (wettest) climates of Africa. Overview: An annual, erect herb up to 5 m (but typically about 2 m) tall. Stems succulent with scattered, stiff hairs. The whole plant has an aromatic smell resembling cloves. Leaves: Up to 50 cm wide and 35 cm long, deeply lobed, with toothed margins, hairy on both surfaces, especially on the nerves. Each leaf is borne on a petiole (leaf stalk) up to 50 cm long. Flowers: Showy, up to 8 cm in diameter, usually yellow with a dark red, purple or mauve centre, borne on a stout flower stalk (peduncle) up to 4 cm long. Stamens (male parts) united into a white, hairless column up to 2.5 cm long. Stigmas (female parts) dark purple. Calyx (whorl of sepals) and epicalyx (whorl of bracts) both present. Fruits: A capsule, 10-20 cm long, roughly circular in cross-section with a pointed end, usually 5-ribbed, borne at the leaf axils. Immature fruit can be purple-red, reddish-green, dark green, pale green or yellow. At maturity, fruits turn brown and split into segments. Seeds: Each fruit has up to 100 spherical or ovoid seeds bearing minute warts in concentric rows. Many cultivars are available, for example 'Clemson Spineless', 'Indiana', 'Emerald' (USA) and 'Pusa Sawani' (India). Okra is widely used in African, Indian, Middle Eastern and Caribbean cuisine and is also popular in southern parts of the USA (where it is the key ingredient in gumbo). Immature fruits are usually boiled, but also fried, steamed, grilled, battered or eaten raw. Fruits are preserved by pickling, or drying and grinding into powder. They are used to make soups, sauces, stews, curries and even salads. Okra is high in fibre and rich in vitamins and minerals, including calcium and vitamin C.
The pods have a unique flavour and texture and release slimy mucilage on cooking, which can be used to thicken sauces and add smoothness to soups. 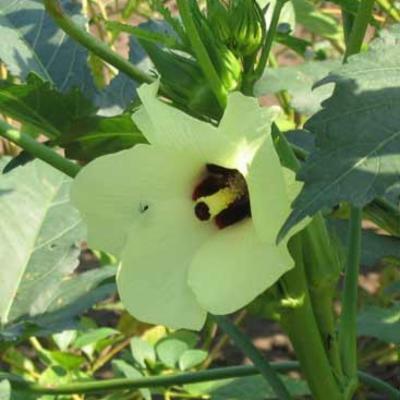 Okra mucilage has also been used in confectionery and for clarifying sugar cane juice to make molasses in India. The slimy texture is not to everyone's taste and can be reduced by cooking in salted water. Young leaves are sometimes used as a vegetable, in a similar manner to spinach, particularly in West Africa and Southeast Asia. Okra leaves are sometimes dried and ground into powder for storage. Flower buds and petals are sometimes eaten in times of food shortage. Okra seeds are often used in place of dried peas, beans or lentils in rice dishes and soups. In Nigeria, seeds are prepared into a food known as dandawan betso . In India, okra seeds are eaten in curries and chutneys. Roasted okra seeds are ground and used as a substitute for coffee in some areas. Considered by some to be one of the best coffee substitutes known, it was once widely used in Central America, Africa and Malaysia. Leaves and immature fruit have long been used in the East in poultices and applied to relieve pain, moisturise skin, induce sweating, prevent scurvy and treat urinary disorders. In Congo-Brazzaville, a leaf decoction is given for heart pains and to promote delivery during childbirth. 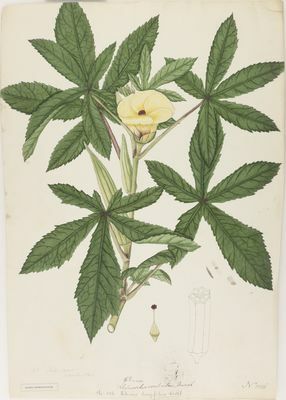 Okra root has been used to treat syphilis in Malaya. 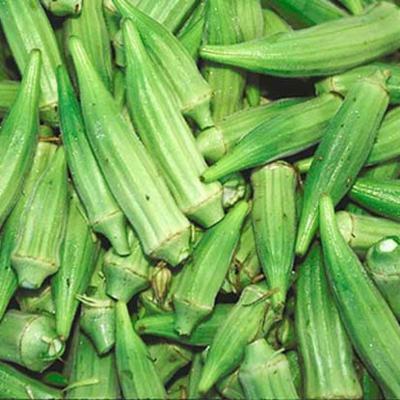 Okra mucilage has been used as a plasma replacement and blood volume expander.To obtain the mucilage, slices of immature pods are placed in water, which is then boiled. The mucilage is an acidic polysaccharide composed of galacturonic acid, rhamnose and glucose and tends to break down when overheated. 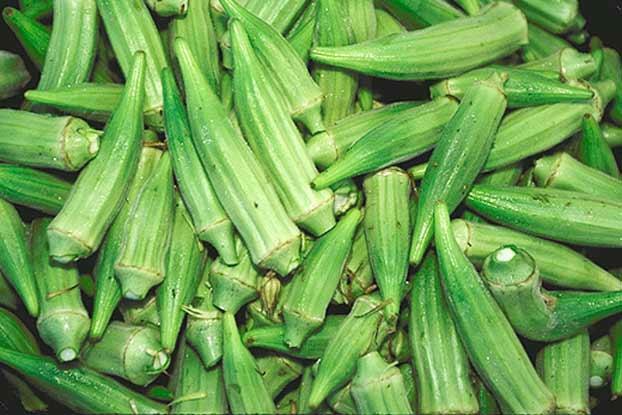 Okra bark yields silky fibre, which is easy to extract. It is white to yellow in colour and strong but rather coarse. It can be spun into yarn, rope and sacking and has been used for fishing lines, game traps and hammocks in West Tropical Africa. It has also been used in paper and cardboard production. Okra leaves and seed-cake are sometimes used as cattle feed, and the leafy tops are grazed by stock and game. Okra mucilage has been added as size to glaze paper in China. A collection of Abelmoschus esculentus seeds is held in Kew's Millennium Seed Bank based at Wakehurst in West Sussex. 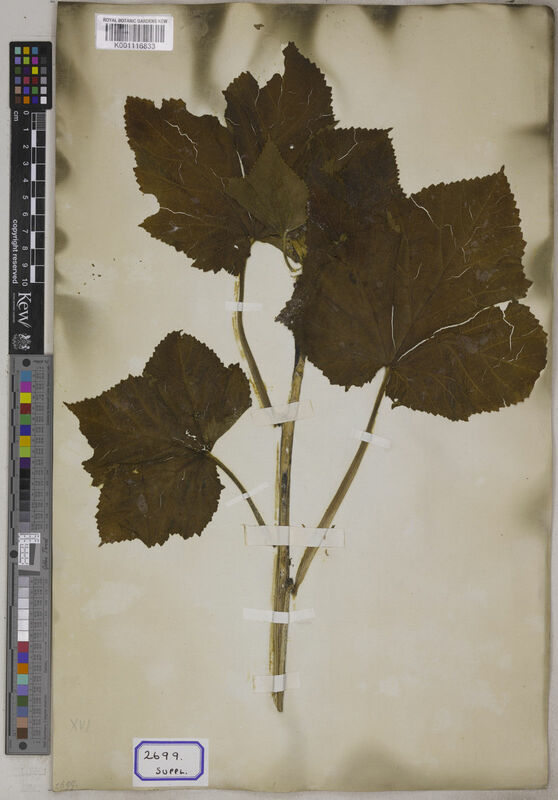 Dried and spirit-preserved specimens of Abelmoschus esculentus are held in Kew's Herbarium where they are available to researchers by appointment. The details of some of these specimens can be seen online in Kew's Herbarium Catalogue. Specimens of the seeds and fruits of okra, as well as fibres obtained from it, and paper and rope made from it, are held in Kew's Economic Botany Collection in the Sir Joseph Banks Building, where they are available to researchers by appointment. 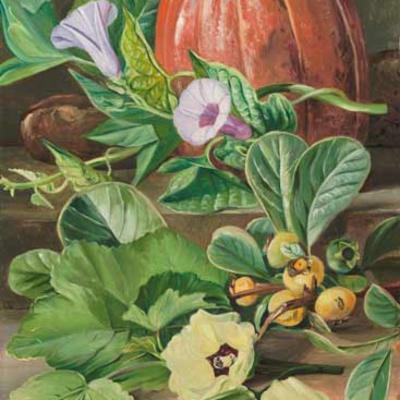 Kew's illustration collection includes a painting of okra by Victorian artist Marianne North. 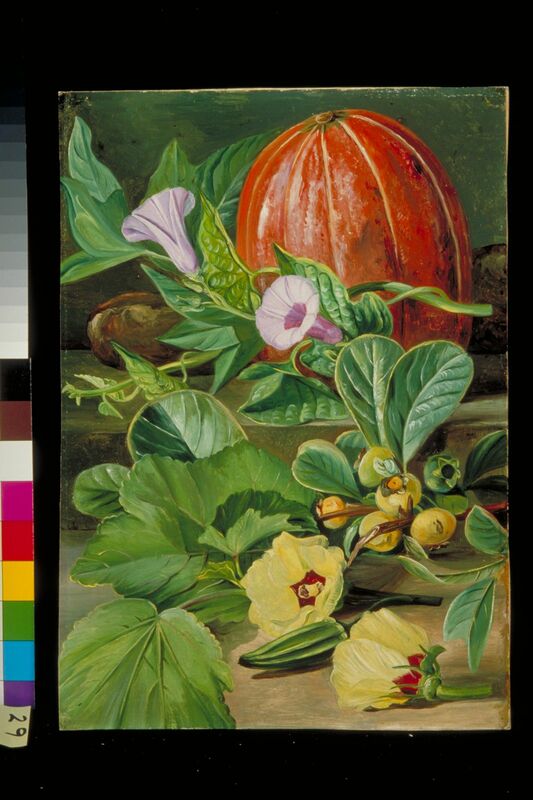 The title is Some Fruits and Vegetables used in Brazil , and notes included the following: 'In front the Ochro ( Hibiscus esculentus L.), the seed-vessels of which are used in thickening soups'. Irritating hairs are sometimes present on leaves and stems, and traces of alkaloid have been reported in leaves. Flowers large, yellow, with purple or red centre. Düzyaman, E. (2010) Okra: botany and horticulture. In: Horticultural Reviews, Volume 21, ed. J. Janick, John Wiley & Sons, Inc., Oxford, UK. Vaughan, J. G. & Geissler, C. A. (2009). The New Oxford Book of Food Plants. 2nd Edition. Oxford University Press, Oxford, UK. National Research Council (2006). Lost Crops of Africa, Volume 2: Vegetables. The National Academies Press, Washington D.C.
Van Wyk, B-E. (2005). Food Plants of the World: An Illustrated Guide. Timber Press, Inc., Portland, Oregon. Siemonsma, J. S. & Kouamé, C. (2004). Abelmoschus esculentus (L.) Moench. [Internet] Record from PROTA4U. Grubben, G.J.H. & Denton, O.A. (eds), PROTA (Plant Resources of Tropical Africa / Ressources végétales de l’Afrique tropicale), Wageningen, Netherlands. Burkill, H. M. (1997). The Useful Plants of West Tropical Africa, 2nd Edition, Volume 4, Families M–R. Royal Botanic Gardens, Kew, Richmond, UK.